Scene: I hear giggling...sneaky giggling. At the top of the stairs, Charlie is sitting in the baby's new bathtub, Walker is in runner's position behind him ready to push, and Charlie has a rope attached to the front like a set of reins. Ohhhhh my goodness. It's always interesting to see the activities they come up with! 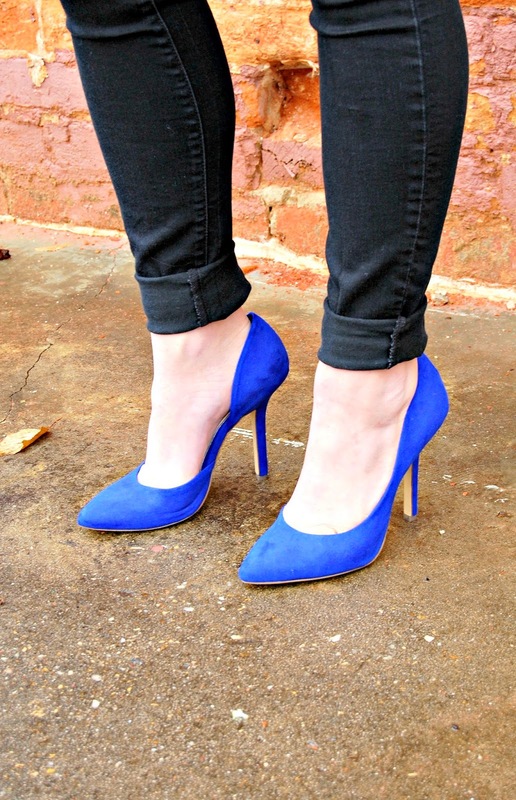 On a different note, aren't these blue suede Jessica Simpson heels fun?! Rack Room Shoes has a ton of beautiful women's dress shoes right now, so I was excited about these. I'll actually be showing another way to style these soon! I'm officially full-term, so let the waiting game begin! Love your lip color and those shoes are gorgeous!! Oh my heart attack! Ha! haha! they are too funny!! and i love the heels. you are braver than me though, i just can't wear heels anymore! Those heels are gorgeous! And I can't believe you can still wear heels! You're a rockstar! 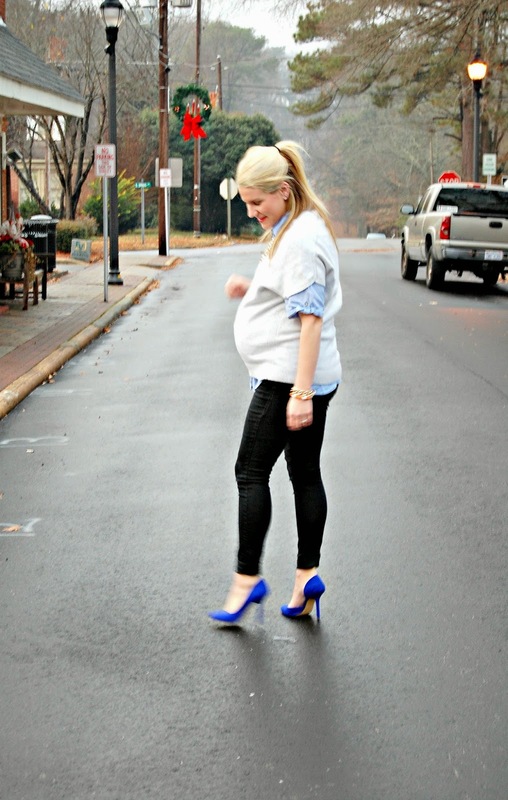 37 weeks and rockin' heels! You go, girl!! 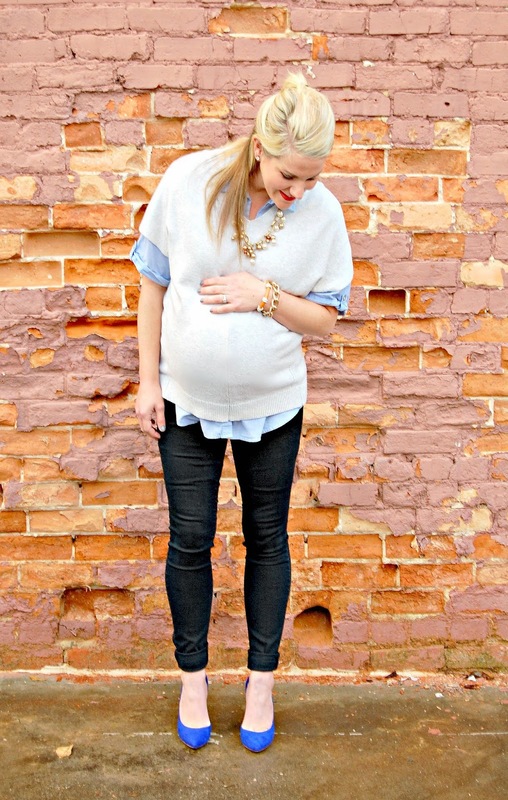 What an adorable look, you are rocking it! You look so adorable! Love this look! Jessica Simpson knows how to design a lady shoe. Those are awesome!